No. 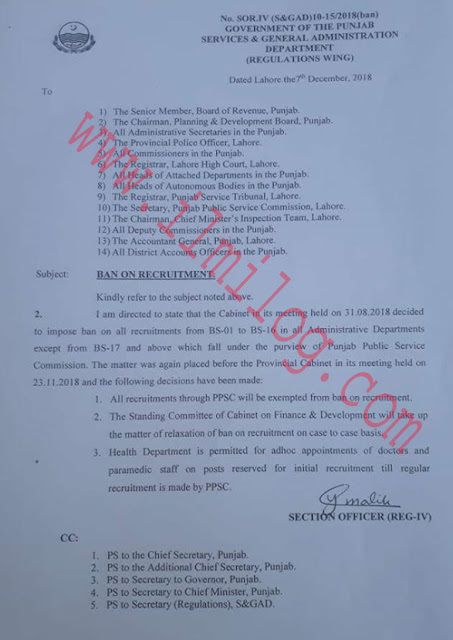 SOR.IV (S&GAD) 10-15 (2018 ban) government of Punjab services & general administration department (regulations wing) dated Lahore 7th December 2018 regarding Punjab Public Services Commission out of Ban on Recruitment in Punjab. I) the senior member, Board of Revenue. Punjab. 2) The Chairman. Planning & Development Board. Punjab. 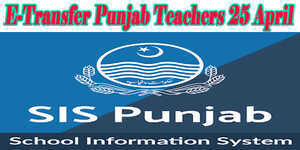 3) All Administrative Secretaries in the Punjab. 4) The Provincial Police Officer, Lahore 5) All Commissioners in the Punjab. 6) The Registrar, Lahore High Court, Lahore. 7) All Head Attached Departments, in the Punjab. 8) All Heads of Autonomous Bodies in the Punjab. 9) The Registrar. Punjab Service Tribunal, Lahore. 10) The Secretary, Punjab Public Service Commission, Lahore. 11) The Chairman. Chief Minister's Inspection Team, Lahore. 12) All Deputy Commissioners in the Punjab. 13) The Accountant General, Punjab. Lahore. 14) All-District Accounts Officers in Punjab. Kindly refer to the subject noted above. 2. I am directed to state that the Cabinet in its meeting held on 31-08-2018 decided to impose the ban on all recruitments from BS-01 to BS-16 in all Administrative Departments except BS-17 and above which tall under the purview of Punjab Public Service Commission. The matter was again placed before the Provincial Cabinet in its meeting held on 23-11-2018 and the following decisions have been made. 1. All recruitments through PPSC will be exempted from a ban on recruitment. 2. The Standing Committee of Cabinet on Finance & Development will take up the matter of relaxation of the ban on recruitment on a case to case basis. 3. 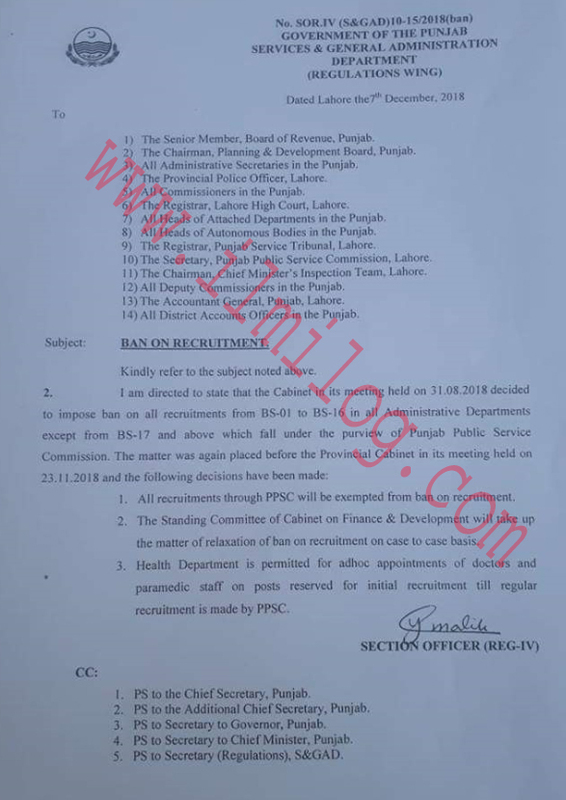 Health Department is permitted for ad-hoc appointments of doctors and paramedic staff on posts reserved for initial recruitment till regular recruitment is made by PPSC. I. PS to the Chief Secretary, Punjab 2. PS to the Additional Chief Secretary, Punjab. 3. PS to Secretary to Governor, Punjab. 4. PS to Secretary to Chief Minister Punjab. 5. PS to Secretary (Regulations), S&GAD.